American modification of the Agena-D upper stage for use as a docking target and space tug for Gemini. Status: Operational 1965. First Launch: 1965-10-25. Last Launch: 1966-11-11. Number: 6 . Gross mass: 3,260 kg (7,180 lb). Height: 7.93 m (26.01 ft). Diameter: 1.52 m (4.98 ft). To provide the Gemini spacecraft with a rendezvous and docking target, Agena D rocket stages were modified with the addition of a docking collar, status panel display, and restart capabilities for the Gemini program. After docking, the Agena had sufficient fuel reserves to boost the Gemini into high earth orbits, to the edge of the Van Allen radiation belts. The program-peculiar forward auxiliary section. This section consisted of the auxiliary equipment rack, the McDonnell Aircraft Company-furnished docking-adapter module, and the clamshell nose shroud. The Agena-D forward and mid-body sections. The Agena-D forward section housed the main equipment bay, and the mid-body contained the main fuel and oxidizer tanks which supplied propellants through a feed and load system for the main engine. (3) the program-peculiar aft section. The Model 8247 multi-start main engine and the smaller Model 8250 maneuvering and ullage orientation engines were located in this section. Orbital length of the GATV was approximately 26 feet. Vehicle weight-on-orbit was approximately 7200 lb. This weight included propellants still remaining in the main tanks and available for Model 8247 engine operation after the Agena achieved orbit. All associated pyro devices and solid-propellant rockets. The XLR-81-BA-13 engine thrust chamber was an 80-percent bell-shape with an expansion ratio of 45:1. This thrust chamber assembly performed satisfactorily throughout a gimbaling orientation of plus 5 deg in a square pattern from the associated planes, with a gimbal acceleration of 30 rads/sec/sec. The nozzle was regeneratively cooled up to the point at which the area ratio was 13.3: I. The remaining portion of the nozzle (13.3:1 to 45:1) was a radiation-cooled titanium extension. The propulsion system was designed to inject the GATV into an orbital path which has an altitude varying between 161 nautical miles (nm) and 87 nm when measured at a latitude of 28. 34 deg. A minimum of five main-engine burns were available to complete the mission requirements; one burn was required for injection into orbit and four subsequent burns were available to perform orbital plane and phase changes, as required and selected from ground stations or from the spacecraft. All launches took place from AMR Pad 14. At the initial location of the injection point, transferring the Agena to a catch-up orbit for placing the vehicle at the rendezvous point when specified. Fuel used was unsymmetrical dimethylhydrazine (UDMH); oxidizer used was inhibited red fuming nitric acid (IRFNA). The propulsion system provided the thrust necessary to place the GATV into a selected orbit and to accomplish major orbital changes. A minimum of five starts was available for performing these maneuvers. Requirements received from the astronauts stated that a dimming circuit must be added to the ASP system, because the panel lights were found to be too bright when the spacecraft docked with the GATV on the night side of the earth. Consequently, a dimming circuit was added to reduce or increase the brightness to the desired level. The dimming circuit functions on all lights except MAIN Red which was always bright when "ON". In order to improve reliability, two lamps were incorporated in each indicator light. Family: Space Tugs. People: McDonnell. Country: USA. Spacecraft: Gemini. Launch Vehicles: Atlas, Atlas SLV-3 Agena D. Launch Sites: Cape Canaveral, Cape Canaveral LC14. Agency: NASA. Bibliography: 126, 2, 205, 2193, 2194, 2195, 2196, 2197, 2198, 2199, 2200, 2201, 2202, 2203, 26, 278, 4365, 6, 6517. 1962 March 5 - . LV Family: Atlas. Launch Vehicle: Atlas SLV-3 Agena D.
Rendezvous radar and transponder system for the Gemini spacecraft. - . Nation: USA. Spacecraft: Gemini, Gemini Radar, Gemini Agena Target Vehicle. Westinghouse Electric Corporation, Baltimore, Maryland, received a $6.8 million subcontract from McDonnell to provide the rendezvous radar and transponder system for the Gemini spacecraft. Purpose of the rendezvous radar, sited in the recovery section of the spacecraft, was to locate and track the target vehicle during rendezvous maneuvers. The transponder, a combined receiver and transmitter designed to transmit signals automatically when triggered by an interrogating signal, was located in the Agena target vehicle. 1962 March 12 - . Launch Vehicle: Atlas SLV-3 Agena D.
Marshall Space Flight Center delivered an Agena procurement schedule (dated March 8) to Gemini Project Office. - . Nation: USA. Spacecraft: Gemini Agena Target Vehicle. Marshall Space Flight Center delivered an Agena procurement schedule (dated March 8) to Gemini Project Office. Air Force Space Systems Division (SSD) was to contract with Lockheed for 11 target vehicles. SSD assigned the Gemini Agena target vehicle program to its Ranger Launch Directorate, which was responsible for programs using Agena vehicles. Marshall also reported the expected delivery of a qualified multiple-restart main engine in 50 weeks, an improvement that removed this development requirement as the pacing item in Agena scheduling. 1962 March 14 - . Launch Vehicle: Atlas SLV-3 Agena D.
Manned Spacecraft Center issued its second analysis of the Gemini program schedule. - . Nation: USA. Spacecraft: Gemini Agena Target Vehicle. Unlike the first, it considered launch vehicles as well as the spacecraft. Procurement of the Agena target vehicle had been initiated so recently that scope for analysis in that area was limited. A key feature of engineering development for the Gemini program was the use of a number of test articles, the lack of which had sometimes delayed the Mercury program; although constructing these test articles might cause some initial delay in Gemini spacecraft construction, the data they would provide would more than compensate for any delay. No problems beset launch vehicle development, but the schedule allowed little contingency time for unexpected problems. The first unmanned qualification flight was still scheduled for late July or early August 1963, but the second (manned) flight was now planned for late October or early November 1963 and the first Agena flight for late April or early Many 1964, with remaining flights to follow at two-month intervals, ending in mid-1965. Flight missions remained unchanged from the January analysis. 1962 May 1 - . Launch Vehicle: Atlas SLV-3 Agena D.
Contract for eight Gemini Agena target vehicles (GATV). - . Nation: USA. Spacecraft: Gemini Agena Target Vehicle. Air Force Space Systems Division (SSD) awarded a letter contract to Lockheed Missiles and Space Company for eight Agena vehicles to be modified as Gemini Agena target vehicles (GATV). Mission requirements were to (1) establish a circular orbit within specified limits, (2) provide a stable target with which the spacecraft could rendezvous and dock, (3) respond to commands from either ground stations or the spacecraft, (4) perform a complex series of orbital maneuvers by means of either real-time or stored commands if less than optimum launch of Agena or spacecraft occurred, and (5) provide an active orbit life of five days. Lockheed's analysis of these mission requirements provided the design criteria for the major modifications required to adapt the Agena to the Gemini mission: (1) modification of the primary propulsion system; (2) addition of a secondary propulsion system (two 16-pound and two 200-pound thrusters) to provide ullage orientation and minor orbit adjustments; (3) design of a digital command and communications subsystem including a programmer, controller, pulse-code-modulated telemetry system, and onboard tape recorder; (4) design of changes to provide the guidance and control functions peculiar to the GATV; and (5) addition of an auxiliary forward equipment rack with an interface capable of supporting the target docking adapter. On direction from Air Force Systems Command Headquarters, SSD authorized Lockheed to proceed with the Gemini-Agena program on March 19. 1962 September 5 - . Launch Vehicle: Atlas SLV-3 Agena D.
For Gemini rendezvous missons, Manned Spacecraft Center intended to launch the Agena target vehicle first. - . Nation: USA. Spacecraft: Gemini Agena Target Vehicle. For Gemini rendezvous missons, Manned Spacecraft Center intended to launch the Agena target vehicle first. If conditions were normal, the spacecraft would be launched the following day..
1962 September 25 - . LV Family: Atlas. Launch Vehicle: Atlas SLV-3 Agena D.
A preliminary design criteria review conference for complex 14, held in Los Angeles, resulted in ground rules for all contractors. - . Nation: USA. Spacecraft: Gemini Agena Target Vehicle. A preliminary design criteria review conference for complex 14, held in Los Angeles, resulted in ground rules for all contractors. Target dates established were (1) stand availability, July 1, 1963; (2) estimated beneficial occupancy date, November 1, 1963; and (3) vehicle on-stand date, February 1, 1964. Complex 14 would be used for launching the Gemini-Agena target vehicle and Mariner spacecraft, but basic modifications would be primarily for the Gemini program. On November 15, 1962, Air Force Space Systems Division reviewed the criteria summary report for complex 14 modifications and suggested only minor engineering changes. 1963 January 21 - . Launch Vehicle: Atlas SLV-3 Agena D, Titan II. Roles of NASA and Department of Defense in Project Gemini. - . Nation: USA. Spacecraft: Gemini Agena Target Vehicle. James E Webb, Administrator of NASA, and Robert S McNamara, Secretary of Defense, concluded a major policy agreement defining the roles of NASA and Department of Defense (DOD) in Project Gemini. The agreement provided for the establishment of a joint NASA-DOD Gemini Program Planning Board. The board would plan experiments, conduct flight tests, and analyze and disseminate results. NASA would continue to manage Project Gemini, while DOD would take part in Gemini development, pilot training, preflight checkout, launch, and flight operations, and would be specifically responsible for the Titan II launch vehicle and the Atlas-Agena target vehicle. DOD would also contribute funds toward the attainment of Gemini objectives. 1963 April 22 - . LV Family: Atlas. Launch Vehicle: Atlas SLV-3 Agena D.
First management review of the Gemini Agena target vehicle (GATV). - . Nation: USA. Spacecraft: Gemini Agena Target Vehicle. Representatives of Air Force Space Systems Division (SSD), Manned Spacecraft Center, and Lockheed met in Sunnyvale for the first management review of the Gemini Agena target vehicle (GATV). Patterned after similar meetings regularly held between SSD, Lewis Research Center, and Lockheed on medium space vehicle satellite and probe programs, the Gemini Target Management Review Meetings encompassed a comprehensive monthly review of the status of the GATV program. 1963 May 21 - . Launch Vehicle: Atlas SLV-3 Agena D.
Gemini program ground rules for revising Agena development and delivery schedules. - . Nation: USA. Spacecraft: Gemini Agena Target Vehicle. As part of the general revision of the Gemini flight program that NASA Headquarters had approved April 29, representatives of NASA, Air Force Space Systems Division, and Lockheed met to establish basic ground rules for revising Agena development and delivery schedules. The first rendezvous mission using the Agena target vehicle was now planned for April 1965, some seven and one half months later than had been anticipated in October 1962. Six months would separate the second Agena launch from the first, and subsequent flights would be at three-month, rather than two-month, intervals. The revised schedule was agreed on at the Atlas/Agena coordination meeting on June 6-7, 1963. Among the major features of the new schedule: Agena communications and control subsystem development was to be completed by December 1963 (back six weeks); other Lockheed development work was to be completed by January 1964 (back three and one-half months); assembly and modification of the first target vehicle was to start April 2, 1964, with the vehicle to be accepted and delivered in January 1965; the first Atlas target launch vehicle was to be delivered in December 1964; the schedule for component manufacturing and deliveries was to be so arranged that the second target vehicle could back up the first, given about nine months' notice. 1963 June 19 - . LV Family: Atlas. Launch Vehicle: Atlas SLV-3 Agena D.
The Cape Gemini/Agena Test Integration Working Group met to define "Plan X" test procedures and responsibilities. - . Nation: USA. Spacecraft: Gemini, Gemini Radar, Gemini Agena Target Vehicle. The Cape Gemini/Agena Test Integration Working Group met to define "Plan X" test procedures and responsibilities. The purpose of Plan X was to verify the Gemini spacecraft's ability to command the Agena target vehicle both by radio and hardline; to exercise all command, data, and communication links between the spacecraft, target vehicle, and mission control in all practical combinations, first with the two vehicles about six feet apart, then with the vehicles docked and latched but not rigidized; and to familiarize the astronauts with operating the spacecraft/target vehicle combination in a simulated rendezvous mission. Site of the test was to be the Merritt Island Launch Area Radar Range Boresight Tower ('Timber Tower'), a 65 x 25 x 50-foot wooden structure. 1963 July 15 - . LV Family: Atlas. Launch Vehicle: Atlas SLV-3 Agena D.
Development tests of the Agena 8247 engine ended in an emergency shutdown. - . Nation: USA. Spacecraft: Gemini Agena Target Vehicle. Development tests of the Agena Model 8247 main engine at Arnold Engineering Development Center ended when the latch-type gas generator valve failed in testing, making an emergency shutdown of the engine necessary. The wrong choice of emergency shutdown procedures caused turbine overspeed and total failure of the engine's turbine pump assembly. As a result of this failure, the valve was redesigned. Because success of the new design was doubtful, a parallel program was initiated to design and develop an alternative valve configuration, solenoid-operated rather than latch-type. Intensive development testing followed; and in a meeting at Bell Aerosystems on November 15, the solenoid type was selected for use in the first flight system of the Agena target vehicle. The new valve allowed significant reductions in engine complexity and increased reliability, but the development effort imposed a serious delay in Preliminary Flight Rating Tests, which had been scheduled to begin in September 1963. 1963 September 5 - . LV Family: Atlas. Launch Vehicle: Atlas SLV-3 Agena D.
Lockheed's contract for the Gemini Agena target vehicle (GATV) was amended. - . Nation: USA. Spacecraft: Gemini Agena Target Vehicle. As a result of the seven-and-one-half-month relaxation of the required launch date for the first GATV, Lockheed was directed to use the improved version of the standard Agena, the AD-62 block of vehicles, instead of AD-13. The AD-62 block originally included the multistart engine, subsequently slipped to the AD-71 block. Lockheed accordingly was directed in January 1964 to substitute the AD-71 for AD-62. The combined effect of these changes was to use up much of the seven-and-one-half-month leeway. The change to AD-62 caused a two-month slip, and changing to AD-71 added a five-week slip. With much of the contingency time gone, the Agena schedule was now tight, and further slippage threatened to cause launch delays. 1963 November - . LV Family: Atlas. Launch Vehicle: Atlas SLV-3 Agena D.
Milestone schedule for the Gemini Agena target vehicle - . Nation: USA. Spacecraft: Gemini Agena Target Vehicle. Lockheed included a milestone schedule for the Gemini Agena target vehicle (GATV) in its monthly progress report for the first time since January 1963. The new schedule reflected the revised Gemini flight program of April 29 and the corresponding revision of the Agena program which followed. It displayed key events in the progress of the first GATV taking place between five and six months later than the January schedule. Engineering development was now scheduled to be completed by May 15, 1964, rather than by December 11, 1963. Completion of modification and final assembly was now planned for June 12 rather than January 10, 1964; preliminary vehicle systems testing was rescheduled from April 10 to September 11, 1964. Special tests, including a Radio frequency Interference Test in the later schedule in addition to the hot-firing scheduled earlier, were to end November 20 instead of May 22, 1964. Final Vehicle Systems Tests were to be completed December 18 instead of June 19, 1964, with shipment to follow on January 6, 1965, rather than June 30, 1964. Launch was now expected on April 15, 1965, seven and one-half months later than the September 1, 1964, date that had been planned in January 1963. 1963 November 17 - . LV Family: Atlas. Launch Vehicle: Atlas SLV-3 Agena D.
Tests to demonstrate structural integrity of the Gemini target docking adapter (TDA). - . Nation: USA. Spacecraft: Gemini Agena Target Vehicle. Douglas Aircraft Corporation, Tulsa, Oklahoma, began a series of tests to demonstrate the structural integrity of the Gemini target docking adapter (TDA) during shroud separation. The shroud, which protected the TDA during the launch and ascent of the Agena target vehicle, was tested under simulated altitude conditions to show proper operation of pyrotechnic devices and adequate clearance between shroud and TDA during separation. Successfully concluded on November 21, and tests demonstrated the compatibility of the TDA with the shroud system during operational performance, with no indication of damage or failure of the TDA structure. 1964 March 20 - . LV Family: Atlas. Launch Vehicle: Atlas SLV-3 Agena D.
Test program to increase confidence in critical components of the Gemini Agena target vehicle. - . Nation: USA. Spacecraft: Gemini Agena Target Vehicle. Manned Spacecraft Center (MSC) approved Air Force Space Systems Division's (SSD) recommendations for a test program to increase confidence in 16 critical electronic and electrical components of the Gemini Agena target vehicle. The program included complete electromagnetic interference (EMI) testing of all components peculiar to the Gemini mission, as well as elevated stress tests and extended life tests. SSD had also recommended subsystem-level, as well as component-level, EMI testing, but this part of the program MSC disapproved. SSD directed Lockheed to proceed with the program on March 23. EMI tests were scheduled to be completed by July 1, stress and life tests by September 1, 1964. 1964 April 30 - . LV Family: Atlas. Launch Vehicle: Atlas SLV-3 Agena D.
First Agena D for the Gemini program. - . Nation: USA. Flight: Gemini 12. Spacecraft: Gemini, Gemini Radar, Gemini Agena Target Vehicle. Air Force Space Systems Division (SSD) accepted the first Agena D (AD-71) for the Gemini program. The Agena D was a production-line vehicle procured from Lockheed by SSD for NASA through routine procedures. Following minor retrofit operations, the vehicle, now designated Gemini Agena target vehicle 5001, entered the manufacturing final assembly area at the Lockheed plant on May 14. There began the conversion of the Agena D into a target vehicle for Gemini rendezvous missions. Major modifications were installation of a target docking adapter (supplied by McDonnell), an auxiliary equipment rack, external status displays, a secondary propulsion system, and an L-band tracking radar. 1964 June 3 - . LV Family: Atlas. Launch Vehicle: Atlas SLV-3 Agena D.
Lockheed inaugurated the Gemini Extra Care Program to reduce the incidence of equipment failures and discrepancies. - . Nation: USA. Spacecraft: Gemini Agena Target Vehicle. Lockheed inaugurated the Gemini Extra Care Program to reduce the incidence of equipment failures and discrepancies. In cooperation with Air Force and NASA, Lockheed inaugurated the Gemini Extra Care Program to reduce the incidence of equipment failures and discrepancies resulting from poor or careless workmanship during the modification and assembly of the Agena target vehicle. The program included increased inspection, exhortation, morale boosters, special awards, and other activities aimed at fostering and maintaining a strong team spirit at all levels. Results of the program were evidenced in a drastic decline in the number of FEDRs (Failed Equipment and Discrepancy Reports) recorded in the Gemini final manufacturing area on successive vehicles. 1964 September 24 - . LV Family: Atlas. Launch Vehicle: Atlas SLV-3 Agena D.
Final assembly of Gemini Agena target vehicle 5001 - . Nation: USA. Flight: Gemini 12. Spacecraft: Gemini Agena Target Vehicle. Lockheed completed the modification and final assembly of Gemini Agena target vehicle 5001 and transferred it to systems test complex C-10 at the Lockheed plant. Lockheed began the task of hooking the vehicle up for systems testing the next day, September 25. 1964 November 10 - . LV Family: Atlas. Launch Vehicle: Atlas SLV-3 Agena D.
Gemini Agena target vehicle (GATV) 5001 competed a simulated flight (ascent and orbit) at Lockheed test complex C-10. - . Nation: USA. Flight: Gemini 12. Spacecraft: Gemini Agena Target Vehicle. Gemini Agena target vehicle (GATV) 5001 competed a simulated flight (ascent and orbit) at Lockheed test complex C-10. Minor anomalies required portions of the test to be rerun. This concluded GATV 5001 systems tests in preparation for captive-firing tests to be conducted at Lockheed's Santa Cruz Test Base. The vehicle was shipped November 30. 1964 November 30 - . LV Family: Atlas. Launch Vehicle: Atlas SLV-3 Agena D.
Lockheed shipped Gemini Agena target vehicle (GATV) 5001 to its Santa Cruz Test Base for captive-firing tests. - . Nation: USA. Flight: Gemini 12. Spacecraft: Gemini Agena Target Vehicle. 1964 December 12 - . LV Family: Atlas. Launch Vehicle: Atlas SLV-3 Agena D.
Deletion of the eighth Agena from the Gemini Agena target vehicle program. - . Nation: USA. Spacecraft: Gemini Agena Target Vehicle. Gemini Program Office (GPO) reported that it had initiated contractual action to delete the eighth Agena from the Gemini Agena target vehicle program. On March 6, 1965, GPO reported its decision to eliminate the seventh Agena as well..
1964 December 17 - . LV Family: Atlas. Launch Vehicle: Atlas SLV-3 Agena D.
Air Force Space Systems Division officially accepted Agena D (AD-82) for the Gemini program. - . Nation: USA. Flight: Gemini 6. Spacecraft: Gemini Agena Target Vehicle. Lockheed then transferred it to the vehicle final assembly area for modification to Gemini Agena target vehicle 5002. Work was scheduled to begin in mid-January 1965..
1965 January 20 - . LV Family: Atlas. Launch Vehicle: Atlas SLV-3 Agena D.
Gemini Agena target vehicle 5001 underwent a successful hot-firing test at Lockheed's Santa Cruz Test Base. - . Nation: USA. Flight: Gemini 12. Spacecraft: Gemini Agena Target Vehicle. Gemini Agena target vehicle 5001 underwent a successful hot-firing test at Lockheed's Santa Cruz Test Base. The test simulated a full 20,000-second mission, including multiple firings of both the primary and secondary propulsion systems and transmission of operational data in real time to two PCM (pulse-code-modulated) telemetry ground stations, one at the test site and one in Sunnyvale. Major test anomaly was a series of command programmer time-accumulator jumps, seven of which totaled 77,899 seconds. The vehicle was removed from the test stand on February 1 and returned to Sunnyvale. 1965 February 1 - . LV Family: Atlas. Launch Vehicle: Atlas SLV-3 Agena D.
Gemini Agena target vehicle (GATV) 5001 was removed from the test stand at Santa Cruz Test Base and returned to Sunnyvale. - . Nation: USA. Flight: Gemini 12. Spacecraft: Gemini Agena Target Vehicle. 1965 March 9 - . LV Family: Atlas. Launch Vehicle: Atlas SLV-3 Agena D.
Gemini Agena target vehicle 5001 completed electromagnetic compatibility tests in the anechoic chamber at Sunnyvale. - . Nation: USA. Flight: Gemini 12. Spacecraft: Gemini Agena Target Vehicle. Gemini Agena target vehicle 5001 completed electromagnetic compatibility tests in the anechoic chamber at Sunnyvale. It remained in the chamber, however, until March 17 while Lockheed verified the corrective action that had been taken to eliminate programmer time-accumulator jumps and telemetry synchronization problems. The vehicle was then transferred to systems test complex C-10 for final Vehicle Systems Tests on March 18. 1965 March 18 - . LV Family: Atlas. Launch Vehicle: Atlas SLV-3 Agena D.
1965 March 23-24 - . Launch Vehicle: Atlas SLV-3 Agena D.
1965 April 9 - . LV Family: Atlas. Gemini/Atlas/Agena Target Vehicle responsibility. - . Spacecraft: Gemini, Gemini Agena Target Vehicle. Space Systems Division and NASA signed an agreement for the Gemini/Atlas/Agena Target Vehicle (GAATV) program. NASA had overall management responsibility for the program..
1965 April 13 - . LV Family: Atlas. Launch Vehicle: Atlas SLV-3 Agena D.
Gemini - Agena Target Vehicle Responsibilities. - . Nation: USA. Spacecraft: Gemini Agena Target Vehicle. Manned Spacecraft Center delivered the 'Gemini Atlas Agena Target Vehicle Systems Management and Responsibilities Agreement' to Air Force Space Systems Division (SSD) with signatures of Director Robert R. Gilruth and Gemini Program Manager Charles W. Mathews (dated April 9). Major General Ben I. Funk, SSD Commander, and Colonel John B. Hudson, SSD Deputy for Launch Vehicles, had signed for SSD on March 31 and 29 respectively. The agreement, dated March 1965, followed months of negotiation and coordination on management relationships and fundamental responsibilities for the Gemini Agena target vehicle program. It clarified and supplemented the 'Operational and Management Plan for the Gemini Program' (December 29, 1961) with respect to the target vehicle program. 1965 May 6 - . LV Family: Atlas. Launch Vehicle: Atlas SLV-3 Agena D.
Gemini Agena target vehicle (GATV) 5001 completed vehicle systems testing with a final simulated flight. - . Nation: USA. Flight: Gemini 12. Spacecraft: Gemini Agena Target Vehicle. Gemini Agena target vehicle (GATV) 5001 completed vehicle systems testing with a final simulated flight. The vehicle was disconnected from the test complex on May 14, and data analysis was completed May 19. Meanwhile, the First Article Configuration Inspection on GATV 5001 began on May 10. 1965 May 10 - . LV Family: Atlas. Launch Vehicle: Atlas SLV-3 Agena D.
First Article Configuration Inspection (FACI) of Gemini Agena target vehicle (GATV) 5001 at Sunnyvale. - . Nation: USA. Flight: Gemini 12, Gemini 6. Spacecraft: Gemini Agena Target Vehicle. 1965 May 18 - . LV Family: Atlas. Launch Vehicle: Atlas SLV-3 Agena D.
Gemini Agena target vehicle (GATV) 5002 completed final assembly - . Nation: USA. Flight: Gemini 6. Spacecraft: Gemini Agena Target Vehicle. Gemini Agena target vehicle (GATV) 5002 completed final assembly and was transferred to systems test complex C-10 at Sunnyvale to begin Vehicle Systems Tests. The transfer had been scheduled for May 5 but was delayed by parts shortages, engineering problems, and considerable work backlog. The major source of delay was correcting a gap between the forward auxiliary rack and the vehicle; machining and aligning the rack and refinishing the scraped surfaces proved time-consuming. GATV 5002 was still short several items of command equipment. Systems testing began May 21. 1965 May 27 - . Launch Vehicle: Atlas SLV-3 Agena D.
Air Force Space Systems Division Gemini Agena target vehicle (GATV) 5001 not acceptable. - . Nation: USA. Flight: Gemini 12. Spacecraft: Gemini Agena Target Vehicle. 1965 May 29 - . LV Family: Atlas. Launch Vehicle: Atlas SLV-3 Agena D.
Gemini Agena target vehicle 5001 arrived at Cape Kennedy following its conditional acceptance by the Air Force on May 27. - . Nation: USA. Flight: Gemini 6. Spacecraft: Gemini Agena Target Vehicle. Gemini Agena target vehicle 5001 arrived at Cape Kennedy following its conditional acceptance by the Air Force on May 27. It was moved to the Missile Assembly Building (Hanger E) for testing. The target vehicle was mated with target docking adapter No. 1 on June 18, and Combined Interface Tests began June 19. Testing was completed July 8 with secondary propulsion system (SPS) functional and static leak checks, SPS installation and postinstallation checks, and thermal control surface preparation. Target vehicle 5001 was then transferred to complex 14 to be mated to target launch vehicle 5301. 1965 June 30 - . LV Family: Atlas. Launch Vehicle: Atlas SLV-3 Agena D.
Gemini Agena target vehicle 5002 completed Vehicle Systems Tests at Sunnyvale, and the final acceptance test was conducted. - . Nation: USA. Flight: Gemini 6. Spacecraft: Gemini Agena Target Vehicle. Gemini Agena target vehicle 5002 completed Vehicle Systems Tests at Sunnyvale, and the final acceptance test was conducted. The vehicle was disconnected from the test complex on July 13, after NASA, Air Force Space Systems Division, Aerospace, and Lockheed representatives agreed that all data discrepancies from the final systems tests had been resolved. 1965 July 8 - . Launch Vehicle: Atlas SLV-3 Agena D.
Gemini Agena target vehicle 5001 completed systems tests - . Nation: USA. Flight: Gemini 6. Spacecraft: Gemini Agena Target Vehicle. Gemini Agena target vehicle 5001 completed systems tests in Hanger E and was transferred to complex 14, where it was mated to Atlas standard launch vehicle 5301. Tests began in preparation for a Simultaneous Launch Demonstration on July 22..
1965 July 22 - . Launch Vehicle: Atlas SLV-3 Agena D.
1965 July 23 - . LV Family: Atlas. Launch Vehicle: Atlas SLV-3 Agena D.
Gemini Agena target vehicle 5002 completed. - . Nation: USA. Flight: Gemini 6. Spacecraft: Gemini Agena Target Vehicle. Air Force Space Systems Division formally accepted delivery of Gemini Agena target vehicle (GATV) 5002 after the vehicle acceptance team inspection had been completed. The vehicle was then shipped by air to Eastern Test Range on July 24, arriving July 25. Although GATV 5002 was accepted, several items of equipment remained in 'not qualified' status, including the shroud, secondary and primary propulsion systems, and components of both the electrical power and command systems. Gemini Agena target vehicle 5003. - . Nation: USA. Flight: Gemini 8. Spacecraft: Gemini Agena Target Vehicle. Standard Agena D (AD-108), which had been completed in June and held in storage, was transferred to Building 104 at Sunnyvale for modifications and final assembly as Gemini Agena target vehicle 5003. While in storage, several pieces of AD-108 equipment had been removed for modification to the Gemini configuration. Final assembly began August 8. Gemini Agena target vehicle 5001 demated. - . Nation: USA. Flight: Gemini 6. Spacecraft: Gemini, Gemini Agena Target Vehicle. Atlas standard launch vehicle 5301 and Gemini Agena target vehicle (GATV) 5001 were demated at complex 14, following the Simultaneous Launch Demonstration of July 22. GATV 5001 was returned to Hanger E, where it was stored as the backup vehicle for GATV 5002. On August 18, GATV 5002 was officially designated as the target vehicle for Gemini VI, the first rendezvous mission, while GATV 5001 was to be maintained in flight-ready condition as backup. Atlas 5301, which had been returned to Hanger J after demating, was moved back to complex 14 on August 16 to serve as the target launch vehicle for GATV 5002. 1965 August 23 - . LV Family: Atlas. Launch Vehicle: Atlas SLV-3 Agena D.
Gemini Agena target vehicle 5002 completed preliminary systems testing at Hanger E. - . Nation: USA. Flight: Gemini 6. Spacecraft: Gemini Agena Target Vehicle. Gemini Agena target vehicle 5002 completed preliminary systems testing at Hanger E and was transferred to Merritt Island Launch Area, where it was joined by spacecraft No. 6 for Plan X testing. After ground equipment checks, Plan X tests proceeded on August 25. No significant interference problems were found, and testing ended on August 31. 1965 September 1 - . LV Family: Atlas. Launch Vehicle: Atlas SLV-3 Agena D.
Final troubleshooting on Gemini Agena target vehicle (GATV) 5002 after Plan X testing at Merritt Island Launch Area (MILA) was completed. - . Nation: USA. Flight: Gemini 6. Spacecraft: Gemini Agena Target Vehicle. Final troubleshooting on Gemini Agena target vehicle (GATV) 5002 after Plan X testing at Merritt Island Launch Area (MILA) was completed. The next day GATV 5002 was returned to Hanger E from MILA, where it began a series of tests to verify the operational readiness of all vehicle systems prior to erection and mating with the launch vehicle. 1965 October 1 - . LV Family: Atlas. Launch Vehicle: Atlas SLV-3 Agena D.
Gemini Agena target vehicle 5002 was transported to complex 14 and mated to target launch vehicle 5301. - . Nation: USA. Flight: Gemini 6. Spacecraft: Gemini Agena Target Vehicle. Gemini Agena target vehicle 5002 was transported to complex 14 and mated to target launch vehicle 5301. Preliminary checks were followed, on October 4, by the Joint Flight Acceptance Composite Test (J-FACT). J-FACT was a combined check of all contractors, the range, the vehicles, and aerospace ground equipment in a simulated countdown and flight; propellants and high pressure gases were not loaded, nor was the gantry removed. Simultaneous Launch Demonstration was successfully completed October 7. 1965 October 6 - . Launch Vehicle: Atlas SLV-3 Agena D.
The final design review for the Gemini Atlas-Agena target vehicle ascent guidance equations was held. - . Nation: USA. Spacecraft: Gemini Agena Target Vehicle. The equations, using target launch vehicle pitch and yaw steering and Gemini Agena target vehicle nodal steering, were found to have been adequately tested and well within required accuracy limits. The equations were approved as ready for flight..
1965 October 7 - . Launch Vehicle: Atlas SLV-3 Agena D.
Wet Mock Simulated Launch of Gemini-Titan 6. - . Nation: USA. Flight: Gemini 6. Spacecraft: Gemini Agena Target Vehicle. The Wet Mock Simulated Launch (WMSL) of Gemini-Titan (GT) 6 and the Simultaneous Launch Demonstration with GT-6 and the Gemini Atlas-Agena target vehicle were conducted. Following WMSL, the spacecraft and launch vehicle were demated to allow the spacecraft battery to be replaced. They were remated October 8-13. Spacecraft Systems Test was completed October 15. Prelaunch testing concluded October 20 with the Simulated Flight Test. 1965 October 14 - . LV Family: Atlas. Launch Vehicle: Atlas SLV-3 Agena D.
Gemini Agena target vehicle 5003 was transferred to Vehicle Systems Test after completing final assembly on October 9. - . Nation: USA. Flight: Gemini 8. Spacecraft: Gemini Agena Target Vehicle. Gemini Agena target vehicle 5003 was transferred to Vehicle Systems Test after completing final assembly on October 9. Testing began October 18..
1965 October 20 - . Launch Vehicle: Atlas SLV-3 Agena D.
Systems testing at complex 14 of the Gemini Atlas-Agena target vehicle for Gemini VI was completed with a launch readiness demonstration. - . Nation: USA. Flight: Gemini 6. Spacecraft: Gemini Agena Target Vehicle. Systems testing at complex 14 of the Gemini Atlas-Agena target vehicle for Gemini VI was completed with a launch readiness demonstration. Final vehicle closeout and launch preparations began October 21 and continued until final countdown on October 25..
1965 October 25 - . Launch Vehicle: Atlas SLV-3 Agena D.
Gemini 6 mission canceled. - . Nation: USA. Flight: Gemini 6. Spacecraft: Gemini Agena Target Vehicle. The Gemini VI mission was canceled when Gemini Agena target vehicle (GATV) 5002 suffered what appeared to be a catastrophic failure shortly after separating from the Atlas launch vehicle. The Gemini Atlas-Agena target vehicle was launched from complex 14 at 10:00 a.m., e.s.t. When the two vehicles separated at 10:05, all signals were normal. But approximately 375 seconds after liftoff, vehicle telemetry was lost and attempts to reestablish contact failed. The Gemini VI countdown was held and then canceled at 10:54 a.m., because the target vehicle had failed to achieve orbit. In accordance with Air Force Space Systems Division (SSD) procedures and NASA management instructions - both of which specified investigation in the event of such a failure - Major General Ben I. Funk, SSD Commander, reconvened the Agena Flight Safety Review Board, and NASA established a GATV Review Board. 1965 October 25 - . 15:00 GMT - . Launch Site: Cape Canaveral. Launch Complex: Cape Canaveral LC14. LV Family: Atlas. Launch Vehicle: Atlas SLV-3 Agena D. FAILURE: Exploded 6 minutes after takeoff. Failure.. Failed Stage: U.
Gemini 6 Agena Target - . Payload: TDA-2. Mass: 3,261 kg (7,189 lb). Nation: USA. Agency: NASA. Class: Manned. Type: Manned logistics spacecraft. Flight: Gemini 6, Gemini 7. Spacecraft Bus: Agena. Spacecraft: Gemini Agena Target Vehicle. Decay Date: 1965-10-25 . The Agena target vehicle failed to reach orbit. Gemini 6, awaiting launch, was cancelled. In the ashes of this setback, the idea of launching Gemini 6 to rendezvous with Gemini 7 was born..
1965 October 27 - . LV Family: Atlas. Launch Vehicle: Atlas SLV-3 Agena D.
Catastrophic anomaly of Gemini Agena target vehicle (GATV) 5002 on October 25 defined as a mission failure. - . Nation: USA. Flight: Gemini 6. Spacecraft: Gemini Agena Target Vehicle. 1965 October 28 - . LV Family: Atlas. Launch Vehicle: Atlas SLV-3 Agena D.
Discrepancies remaining on Gemini Agena target vehicle 5001 cleared. - . Nation: USA. Flight: Gemini 12. Spacecraft: Gemini Agena Target Vehicle. The major portion of 819 discrepancies remaining from the First Article Configuration Inspection (FACI) of Gemini Agena target vehicle 5001 in June were cleared; 128 that had not been applied against the acceptance document (DD-250) remained. All subsystem FACI discrepancies were also closed out during October. 1965 November 1 - . LV Family: Atlas. Launch Vehicle: Atlas SLV-3 Agena D.
1965 November 3 - . LV Family: Atlas. Launch Vehicle: Atlas SLV-3 Agena D.
Investigation of the failure of Gemini Agena target vehicle 5002 - . Nation: USA. Flight: Gemini 6. Spacecraft: Gemini Agena Target Vehicle. 1965 November 12-13 - . LV Family: Atlas. Launch Vehicle: Atlas SLV-3 Agena D.
A symposium on hypergolic rocket ignition at altitude was held at Lockheed. - . Nation: USA. Flight: Gemini 6. Spacecraft: Gemini Agena Target Vehicle. 1965 November 15 - . LV Family: Atlas. Launch Vehicle: Atlas SLV-3 Agena D.
Gemini Agena target vehicle (GATV) engine modification and test program. - . Nation: USA. Related Persons: Hohmann, Bernhard. Spacecraft: Gemini Agena Target Vehicle. Lockheed presented its proposed Gemini Agena target vehicle (GATV) engine modification and test program to Colonel A. J. Gardner, Gemini Target Vehicle Program Director, Air Force Space Systems Division (SSD). The proposal was immediately turned over to a three-man team comprising B. A. Hohmann (Aerospace), Colonel J. B. Hudson (Deputy Commander for Launch Vehicles, SSD), and L. E. Root (Lockheed) for consideration. On November 18, the group decided on a final version of the proposal that called for: (1) modifying the Agena engine to provide oxidizer lead during the start sequence, (2) demonstrating sea-level engine flightworthiness in tests at Bell Aerosystems, and (3) conducting an altitude test program at Arnold Engineering Development Center. The final proposal was presented to the GATV Review Board at Manned Spacecraft Center on November 20. 1965 November 19 - . LV Family: Atlas. Launch Vehicle: Atlas SLV-3 Agena D.
Air Force Space Systems Division (SSD) directed Lockheed to return Gemini Agena target vehicle (GATV) 5001 to Sunnyvale. - . Nation: USA. Flight: Gemini 12. Spacecraft: Gemini Agena Target Vehicle. 1965 November 24 - . LV Family: Atlas. Launch Vehicle: Atlas SLV-3 Agena D.
Lockheed submitted an engineering change proposal to Air Force Space Systems Division (SSD) for Project Surefire. - . Nation: USA. Flight: Gemini 8, Gemini 9. Spacecraft: Gemini Agena Target Vehicle. 1965 December 14 - . LV Family: Atlas. Launch Vehicle: Atlas SLV-3 Agena D.
Disassembly and inspection of Gemini Agena target vehicle 5001 to determine the extent of refurbishment. - . Nation: USA. Flight: Gemini 12. Spacecraft: Gemini Agena Target Vehicle. Air Force Space Systems Division authorized Lockheed to begin the disassembly and inspection of Gemini Agena target vehicle 5001 to determine the extent of refurbishment needed. The vehicle was stripped down to its major structural components to expose all areas of possible contamination. 1965 December 17 - . LV Family: Atlas. Launch Vehicle: Atlas SLV-3 Agena D.
Gemini Agena target vehicle (GATV) 5003 main engine - . Nation: USA. Flight: Gemini 8. Spacecraft: Gemini Agena Target Vehicle. The Air Force accepted the main rocket engine for Gemini Agena target vehicle (GATV) 5003 after Bell Aerosystems had completed Project Surefire modifications. The engine was shipped immediately and arrived at Lockheed December 18. Lockheed completed reinstalling the engine on December 20. GATV 5003 systems retesting began December 27 after other equipment modifications had been installed. 1966 January 8 - . LV Family: Atlas. Launch Vehicle: Atlas SLV-3 Agena D.
Gemini Agena target vehicle (GATV) 5003 completed its final acceptance tests. - . Nation: USA. Flight: Gemini 8. Spacecraft: Gemini Agena Target Vehicle. Gemini Agena target vehicle (GATV) 5003 completed its final acceptance tests at Sunnyvale, after an elusive command system problem had made it necessary to rerun the final systems test (January 4). No vehicle discrepancy marred the rerun. Air Force Space Systems Division formally accepted GATV 5003 on January 18, after the vehicle acceptance team inspection. It was shipped to Eastern Test Range the same day, but bad weather delayed delivery until January 21. GATV 5003 was to be the target vehicle for Gemini VIII. 1966 January 16 - . LV Family: Atlas. Launch Vehicle: Atlas SLV-3 Agena D.
Project Surefire verification testing began at Bell Aerosystems. - . Nation: USA. Flight: Gemini 8. Spacecraft: Gemini Agena Target Vehicle. Bell's part in the test program was to demonstrate the sea-level flightworthiness of the modified Agena main engine. Bell completed testing on March 4 with a full 180-second mission simulation firing. The successful completion of this phase of the test program gave the green light for the launch of Gemini Agena target vehicle 5003, scheduled for March 15. 1966 January 22 - . LV Family: Atlas. Launch Vehicle: Atlas SLV-3 Agena D.
Gemini Agena target vehicle (GATV) 5003 was mated to target docking adapter (TDA) 3. - . Nation: USA. Flight: Gemini 8. Spacecraft: Gemini Agena Target Vehicle. McDonnell had delivered TDA-3 to Cape Kennedy on January 8. The GATV/TDA interface functional test was completed January 24, and the vehicle was transferred to Merritt Island Launch Area for integrated tests with spacecraft No. 8 and extravehicular equipment, which were completed January 28. 1966 January 26 - . LV Family: Atlas. Launch Vehicle: Atlas SLV-3 Agena D.
Gemini Agena target vehicle (GATV) 5004 was transferred to the vehicle systems test area at Sunnyvale. - . Nation: USA. Flight: Gemini 9. Spacecraft: Gemini Agena Target Vehicle. Gemini Agena target vehicle (GATV) 5004 was transferred to the vehicle systems test area at Sunnyvale. Its modified main engine had been received on schedule from Bell Aerosystems January 12 and installed by January 20. Because of GATV 5003 priority, however, several main electronic assemblies, including the command system, had been removed from GATV 5004 and used in GATV 5003 final acceptance tests. As a result, GATV 5004 had fallen eight days behind its scheduled transfer date, January 18. 1966 January 28 - . LV Family: Atlas. Launch Vehicle: Atlas SLV-3 Agena D.
Gemini Agena target vehicle (GATV) 5003 was returned to Hanger E after completing Plan X tests at Merritt Island Launch Area. - . Nation: USA. Flight: Gemini 8. Spacecraft: Gemini Agena Target Vehicle. Gemini Agena target vehicle (GATV) 5003 was returned to Hanger E after completing Plan X tests at Merritt Island Launch Area. Systems Verification and Combined Interface Tests were conducted through February 18, followed by functional checks of the primary and secondary propulsion systems. Hanger E testing ended February 28, and the GATV was transferred to complex 14. 1966 February 2 - . LV Family: Atlas. Launch Vehicle: Atlas SLV-3 Agena D.
Agena D (AD-129) was accepted by the Air Force for delivery to the Gemini program. - . Nation: USA. Flight: Gemini 10. Spacecraft: Gemini Agena Target Vehicle. It was transferred to the final assembly area at Sunnyvale for modification to Gemini Agena target vehicle 5005..
1966 February 27 - . LV Family: Atlas. Launch Vehicle: Atlas SLV-3 Agena D.
Gemini Agena target vehicle (GATV) 5004 completed systems testing at Sunnyvale. - . Nation: USA. Flight: Gemini 9. Spacecraft: Gemini Agena Target Vehicle. It was formally accepted by the Air Force on March 11, following the vehicle acceptance team inspection. The next day (March 12), GATV 5004 was shipped by air to Eastern Test Range, arriving March 14..
1966 March 1 - . Launch Vehicle: Atlas SLV-3 Agena D.
Gemini Agena target vehicle 5003 was mated to targate launch vehicle 5302 at complex 14. - . Nation: USA. Flight: Gemini 8. Spacecraft: Gemini Agena Target Vehicle. After ground equipment compatibility tests, the Joint Flight Acceptance Composite Test was successfully performed on March 7. Simultaneous Launch Demonstration March 8-9 completed Gemini Atlas-Agena target vehicle systems testing in preparation for launch on March 15 as part of the Gemini VIII mission. 1966 March 6 - . Launch Vehicle: Atlas SLV-3 Agena D.
Gemini launch vehicle 8 and spacecraft No. 8 were mated for flight at complex 19. - . Nation: USA. Flight: Gemini 8. Spacecraft: Gemini Agena Target Vehicle. The Simultaneous Launch Demonstration with the Gemini Atlas-Agena target vehicle on complex 14 was completed March 9. The Final Simulated Flight Test concluded prelaunch tests on March 10..
1966 March 16 - . LV Family: Atlas. Launch Vehicle: Atlas SLV-3 Agena D.
Gemini Agena target vehicle 5003 systems exercised. - . Nation: USA. Flight: Gemini 10, Gemini 8. Spacecraft: Gemini Agena Target Vehicle. 1966 March 16 - . 15:00 GMT - . Launch Site: Cape Canaveral. Launch Complex: Cape Canaveral LC14. LV Family: Atlas. Launch Vehicle: Atlas SLV-3 Agena D.
Gemini 8 Agena Target - . Payload: TDA 3/Agena D 5003 GATV. Mass: 3,175 kg (6,999 lb). Nation: USA. Agency: NASA Houston. Class: Manned. Type: Manned logistics spacecraft. Flight: Gemini 8. Spacecraft Bus: Agena. Spacecraft: Gemini Agena Target Vehicle. Decay Date: 1967-09-15 . USAF Sat Cat: 2104 . COSPAR: 1966-019A. Apogee: 299 km (185 mi). Perigee: 285 km (177 mi). Inclination: 28.90 deg. Period: 90.40 min. Target vehicle for Gemini 8..
1966 March 21 - . LV Family: Atlas. Launch Vehicle: Atlas SLV-3 Agena D.
Gemini Agena target vehicle 5004 and spacecraft No. 9 began Plan X compatibility tests at Merritt Island Launch Area Radar Range. - . Nation: USA. Flight: Gemini 9. Spacecraft: Gemini, Gemini Radar, Gemini Agena Target Vehicle. Gemini Agena target vehicle 5004 and spacecraft No. 9 began Plan X compatibility tests at Merritt Island Launch Area Radar Range. .
1966 March 22 - . LV Family: Atlas. Launch Vehicle: Atlas SLV-3 Agena D.
Agena D (AD-130) accepted by the Air Force. - . Nation: USA. Flight: Gemini 11. Spacecraft: Gemini Agena Target Vehicle. Agena D (AD-130) was formally accepted by the Air Force for the Gemini program and moved to Building 104 at Sunnyvale for modification and final assembly as Gemini Agena target vehicle 5006. .
1966 March 24 - . LV Family: Atlas. Launch Vehicle: Atlas SLV-3 Agena D.
Gemini Agena target vehicle 5005 completed final assembly. - . Nation: USA. Spacecraft Bus: Agena. Spacecraft: Gemini Agena Target Vehicle. Gemini Agena target vehicle 5005 completed modification and final assembly with the installation of a number of electrical and electronic components for which it had been waiting. These included the guidance module, flight control junction box, and flight electronics package. The vehicle was transferred to test complex C-10 at Sunnyvale to begin Vehicle Systems Tests. Preliminary test tasks were completed by April 23, with preliminary inspection on April 26-27. 1966 April 12 - . LV Family: Atlas. Launch Vehicle: Atlas SLV-3 Agena D.
Gemini Agena target vehicle 5004 began tests. - . Nation: USA. Flight: Gemini 9. Spacecraft: Gemini Agena Target Vehicle. Gemini Agena target vehicle 5004 began the Combined Interface Test (CIT) at Hanger E, Eastern Test Range, after completing Plan X tests March 24. CIT ended April 22 and engine functional tests of both the primary and secondary propulsion systems followed. Hanger E testing was completed May 1. 1966 May 2 - . Launch Vehicle: Atlas SLV-3 Agena D.
Gemini Agena target vehicle 5004 was transferred to complex 14 and mated to Atlas target launch vehicle 5303. - . Nation: USA. Flight: Gemini 9. Spacecraft: Gemini Agena Target Vehicle. Gemini Agena target vehicle 5004 was transferred to complex 14 and mated to Atlas target launch vehicle 5303. Joint Flight Acceptance Composite Test was completed May 6, and Simultaneous Launch Demonstration followed on May 10..
1966 May 3 - . LV Family: Atlas. Launch Vehicle: Atlas SLV-3 Agena D.
Lockheed completed Combined Systems Acceptance Test on Gemini Agena target vehicle 5005 in test complex C-10 at Sunnyvale. - . Nation: USA. Flight: Gemini 10. Spacecraft: Gemini Agena Target Vehicle. Lockheed completed Combined Systems Acceptance Test on Gemini Agena target vehicle 5005 in test complex C-10 at Sunnyvale. The vehicle was formally accepted by the Air Force on May 14 and delivered to Eastern Test Range on May 16..
1966 May 8 - . LV Family: Atlas. Launch Vehicle: Atlas SLV-3 Agena D.
Refurbishing of Gemini Agena target vehicle (GATV) 5001 - . Nation: USA. Flight: Gemini 12. Spacecraft: Gemini Agena Target Vehicle. Lockheed established a task force to handle the refurbishing of Gemini Agena target vehicle (GATV) 5001 and announced a GATV 5001 Reassembly Plan. The task force's function was to see that GATV 5001 reached a flightworthy condition on time and as economically as possible. The reassembly plan provided an operational base line as well as guidelines for reassembling the vehicle, which was completely disassembled down to the level of riveted or welded parts. GATV 5001 was scheduled for acceptance on September 20 and would be the target vehicle for Gemini XII. 1966 May 17 - . LV Family: Atlas. Launch Vehicle: Atlas SLV-3 Agena D.
Launch of Gemini IX was postponed when Agena target vehicle failed to achieve orbit. - . Nation: USA. Flight: Gemini 9. Spacecraft: Gemini Agena Target Vehicle. 1966 May 17 - . 15:15 GMT - . Launch Site: Cape Canaveral. Launch Complex: Cape Canaveral LC14. LV Family: Atlas. Launch Vehicle: Atlas SLV-3 Agena D. FAILURE: Control system failure.. Failed Stage: G.
Gemini 9 Agena Target - . Payload: TDA 5. Mass: 3,248 kg (7,160 lb). Nation: USA. Agency: NASA. Class: Manned. Type: Manned logistics spacecraft. Flight: Gemini 9. Spacecraft Bus: Agena. Spacecraft: Gemini Agena Target Vehicle, Atlas Target Docking Adapter. Decay Date: 1966-05-17 . The Gemini 9 mission was scrubbed when the Atlas booster launched from Cape Canaveral failed to place the Gemini Agena Target Vehicle (GATV) in its planned circular orbit. A malfunction of the number 2 booster engine of the Atlas caused both the Atlas and Agena to fall into the ocean. The Gemini 9-Atlas/Agena mission was later rescheduled to 1 June using the Augmented Target Docking Adapter (ATDA). 1966 May 25 - . LV Family: Atlas. Launch Vehicle: Atlas SLV-3 Agena D.
Gemini Agena target vehicle 5005 was mated to the target docking adapter (TDA) in Hanger E at Cape Kennedy. - . Nation: USA. Flight: Gemini 10. Spacecraft: Gemini Agena Target Vehicle. Gemini Agena target vehicle 5005 was mated to the target docking adapter (TDA) in Hanger E at Cape Kennedy. McDonnell had delivered the TDA on May 4. After mating, interface functional tests were performed, May 25-27. Preparations then began for Plan X testing with spacecraft No. 10 at Merritt Island Launch Area. 1966 June 1 - . LV Family: Atlas. Launch Vehicle: Atlas SLV-3 Agena D.
Gemini Agena target vehicle 5005 completed preliminary testing. - . Nation: USA. Flight: Gemini 10, Gemini 9. Spacecraft: Gemini Agena Target Vehicle. 1966 June 6 - . LV Family: Atlas. Launch Vehicle: Atlas SLV-3 Agena D.
Gemini Agena target vehicle 5006 completed modification and final assembly and was transferred to Vehicle Systems Test (VST) at Sunnyvale. - . Nation: USA. Flight: Gemini 11. Spacecraft: Gemini Agena Target Vehicle. Gemini Agena target vehicle 5006 completed modification and final assembly and was transferred to Vehicle Systems Test (VST) at Sunnyvale. Although the vehicle lacked the flight control electronics package and guidance module, testing began immediately. The guidance module was received June 7 and the flight control electronics package June 9. Preliminary VST was completed June 17. The Air Force Plant Representative Office at Sunnyvale authorized final acceptance test to begin on June 20. 1966 June 13 - . LV Family: Atlas. Launch Vehicle: Atlas SLV-3 Agena D.
Combined Interface Tests(CIT) of Gemini Agena target vehicle (GATV) 5005 began. - . Nation: USA. Flight: Gemini 10. Spacecraft: Gemini Agena Target Vehicle. CIT was completed June 22, with no significant anomalies detected. Primary and secondary propulsion system functional checks were completed June 30. The GATV was then moved to complex 14..
1966 June 19 - . LV Family: Atlas. Launch Vehicle: Atlas SLV-3 Agena D.
Gemini X prime crew to be Young and Collins. - . Nation: USA. Flight: Gemini 10, Gemini 8. Spacecraft: Gemini Agena Target Vehicle. NASA announced that the Gemini X mission had been scheduled for no earlier than July 18, with John W. Young, command pilot, and Michael Collins, pilot, as the prime crew. Alan L. Bean, command pilot, and Clifton C. Williams, pilot, would be the backup crew. Mission plans would include rendezvous, docking, and extravehicular activity. The spacecraft was scheduled to rendezvous and dock with an Agena target vehicle which was to be launched the same day. 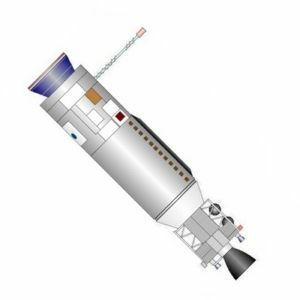 If possible, Gemini X would also rendezvous with the Agena launched in the March 16 Gemini VIII mission. 1966 July 1 - . LV Family: Atlas. Launch Vehicle: Atlas SLV-3 Agena D.
Gemini Agena target vehicle 5005 was transferred to complex 14 and mated to target launch vehicle 5305. - . Nation: USA. Flight: Gemini 10. Spacecraft: Gemini Agena Target Vehicle. Gemini Agena target vehicle 5005 was transferred to complex 14 and mated to target launch vehicle 5305. Joint Flight Acceptance Composite Test was completed July 8. Complex 14 systems tests were completed July 12 with the Simultaneous Launch Demonstration. 1966 July 18 - . LV Family: Atlas. Launch Vehicle: Atlas SLV-3 Agena D.
Gemini Agena target vehicle (GATV) 5006 was mated to target docking adapter (TDA) 6. - . Nation: USA. Flight: Gemini 10, Gemini 11, Gemini 8. Spacecraft: Gemini Agena Target Vehicle. McDonnell had delivered TDA-6 to Cape Kennedy July 7. The interface functional test was completed July 21. The next day GATV 5006 was moved to the Merritt Island Launch Area for integrated tests with spacecraft No. 11 and extravehicular equipment..
1966 July 18 - . 20:39 GMT - . Launch Site: Cape Canaveral. Launch Complex: Cape Canaveral LC14. LV Family: Atlas. Launch Vehicle: Atlas SLV-3 Agena D.
Gemini 10 Agena Target - . Payload: TDA 1A/Agena D 5005 GATV. Mass: 3,175 kg (6,999 lb). Nation: USA. Agency: NASA Houston. Class: Manned. Type: Manned logistics spacecraft. Flight: Gemini 10. Spacecraft Bus: Agena. Spacecraft: Gemini Agena Target Vehicle. Decay Date: 1966-12-29 . USAF Sat Cat: 2348 . COSPAR: 1966-065A. Apogee: 296 km (183 mi). Perigee: 290 km (180 mi). Inclination: 28.90 deg. Period: 90.40 min. An Air Force Titan Gemini Launch Vehicle placed the Gemini 10 (GT-10) spacecraft into orbit for the three-day mission of Astronauts John Young and Michael Collins. Rendezvous and docking were accomplished with the Gemini Agena Target Vehicle (GATV) that had been launched from Cape Kennedy aboard an Atlas Booster just ahead of GT-10. Using the GATV-10 Primary Propulsion System (PPS), the docked vehicles achieved a manned-flight altitude record of 476 miles. Reentry was accomplished on 21 July and recovery was made 544 miles east of Cape Canaveral. Space craft engaged in investigation of spaceflight techniques and technology (US Cat A). 1966 July 21 - . LV Family: Atlas. Launch Vehicle: Atlas SLV-3 Agena D.
Gemini Agena target vehicle made three orbital maneuvers under ground control. - . Nation: USA. Flight: Gemini 10, Gemini 11. Spacecraft: Gemini Agena Target Vehicle. Gemini Agena target vehicle 5001 was transferred to systems test complex. - . Nation: USA. Flight: Gemini 12. Spacecraft: Gemini Agena Target Vehicle. Gemini Agena target vehicle 5001 was transferred to systems test complex C-10 at Sunnyvale, after the long process of refurbishing it had been completed; however, it was still short several pieces of equipment. .
1966 July 26 - . Launch Vehicle: Atlas SLV-3 Agena D.
Gemini target vehicle 5006 systems verification tests. - . Nation: USA. Flight: Gemini 11. Spacecraft: Gemini Agena Target Vehicle. After completing Plan X tests at Merritt Island Launch Area, Gemini target vehicle (GATV) 5006 returned to Hanger E to begin systems verification tests. Combined Interface Tests began August 4 and ended August 12. Primary and secondary propulsion system (PPS and SPS) functional tests began August 13. SPS functionals were completed August 18, and the SPS modules were installed August 19. PPS functionals were completed August 21. GATV 5006 was then transferred to complex 14 for mating with the Atlas. 1966 July 28 - . Launch Vehicle: Atlas SLV-3 Agena D.
Atlas 5306, the target launch vehicle (TLV) for Gemini XI, was erected at launch complex 14. - . Nation: USA. Flight: Gemini 11. Spacecraft: Gemini Agena Target Vehicle. Electrical power was applied the following day. The dual propellant loading (DPL) was run August 18, after a number of liquid oxygen leaks had been eliminated. A discrepancy noted in the vernier engine liquid oxygen bleed system during the first loading required a second DPL, successfully completed on August 22. The Booster Flight Acceptance Composite Test was successfully completed on August 19, and the TLV and Gemini Agena target vehicle were mated on August 22. 1966 September 2 - . LV Family: Atlas. Launch Vehicle: Atlas SLV-3 Agena D.
Gemini Agena target vehicle 5001 was formally accepted by the Air Force after vehicle acceptance team inspection. - . Nation: USA. Flight: Gemini 12. Spacecraft: Gemini Agena Target Vehicle. Gemini Agena target vehicle 5001 was formally accepted by the Air Force after vehicle acceptance team inspection. It was shipped from Sunnyvale on September 3 and arrived at Eastern Test Range on September 4..
1966 September 12 - . 13:05 GMT - . Launch Site: Cape Canaveral. Launch Complex: Cape Canaveral LC14. LV Family: Atlas. Launch Vehicle: Atlas SLV-3 Agena D.
Gemini 11 Agena Target - . Payload: TDA 6/Agena D 5006 GATV. Mass: 3,175 kg (6,999 lb). Nation: USA. Agency: NASA Houston. Class: Manned. Type: Manned logistics spacecraft. Flight: Gemini 11. Spacecraft Bus: Agena. Spacecraft: Gemini Agena Target Vehicle. Decay Date: 1966-12-30 . USAF Sat Cat: 2414 . COSPAR: 1966-080A. Apogee: 298 km (185 mi). Perigee: 298 km (185 mi). Inclination: 28.80 deg. Period: 90.40 min. Docking target for Gemini 11..
1966 September 21 - . LV Family: Atlas. Launch Vehicle: Atlas SLV-3 Agena D.
Gemini Agena target vehicle 5001 began systems test - . Nation: USA. Flight: Gemini 12. Spacecraft: Gemini Agena Target Vehicle. Gemini Agena target vehicle (GATV) 5001 was returned to Hanger E and began systems test after completing Plan X tests at the Merritt Island Launch Area. Systems testing was completed September 29. The Combined Interface Test (September 29-October 13) was followed by functional tests of the primary and secondary propulsion systems, completed October 22. GATV 5001 was then moved to complex 14. 1966 November 11 - . 19:07 GMT - . Launch Site: Cape Canaveral. Launch Complex: Cape Canaveral LC14. LV Family: Atlas. Launch Vehicle: Atlas SLV-3 Agena D.
Gemini 12 Agena Target - . Payload: TDA 7A/Agena D 5001R GATV. Mass: 3,175 kg (6,999 lb). Nation: USA. Agency: NASA Houston. Class: Manned. Type: Manned logistics spacecraft. Flight: Gemini 12. Spacecraft Bus: Agena. Spacecraft: Gemini Agena Target Vehicle. Decay Date: 1966-12-23 . USAF Sat Cat: 2565 . COSPAR: 1966-103A. Apogee: 310 km (190 mi). Perigee: 243 km (150 mi). Inclination: 28.80 deg. Period: 89.90 min. Docking target for Gemini 12..